Did you know that there’s a family-friendly Mardi Gras in Louisiana? Me neither. And just because kids are invited doesn’t mean it’s tame. Raucous fun, spectacles of artistry, wild characters–both in the parade and watching it–and Americana. Meanwhile, I had no idea that the Mardi Gras celebration lasts so long–weeks–or had so many parades (over 40). We went to 7 in two days! 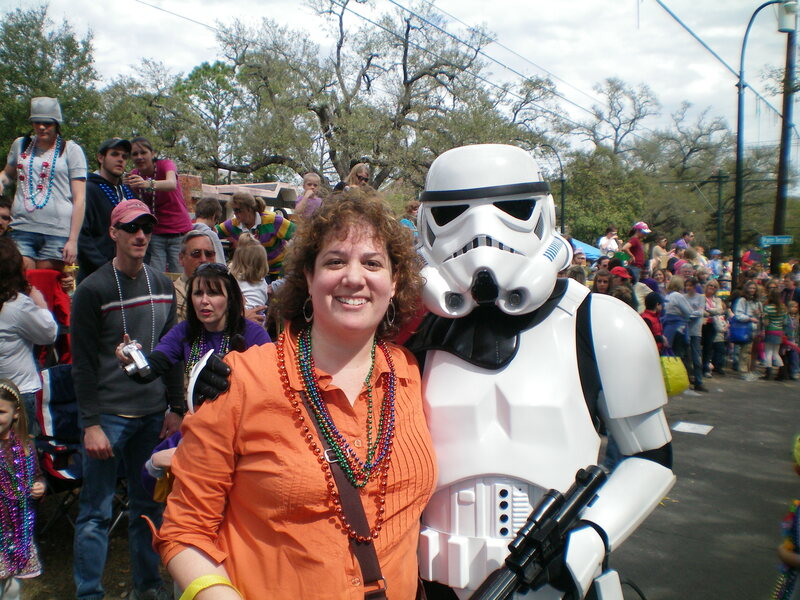 In between floats were horses and characters like people or a Star Wars Storm Trooper. Of course. And then the joy of high school band after high school band. LOVE their hats with plumes! Stay tuned for upcoming posts about why a rubber chicken is so compelling; and the incredible community of people who celebrate Mardi Gras with their families. did you see Muses? or St Anne’s walking parade?